Non-Offensive Touchdowns: What Can We Learn? Welcome back dear readers. It has been a while since I last posted, and in the interest of keeping up my streak of at least one post a month, I decided to satiate my esteemed audience. Today we are going to talk about Non-Offensive Touchdowns. These would be touchdowns scored via returns of interceptions, fumbles, punts, kickoffs, blocked kicks, and occasionally (and gloriously) missed field goals. What I have done in the last month is meticulously sift through data from cfbstats.com and box scores available at sports-reference.com/cfb/ (big thank you to these two great sites) to find every return touchdown between conference opponents since 2005. I neglected to included non-conference games, championship games, and postseason contests (which are non-conference games) because the other numbers I use on this site are all focused around conference play. Sorry Notre Dame and Army fans. Using these numbers, I tested a simple hypothesis: While return touchdowns are modicum of skill, they are also highly random events that can tilt the outcome of an individual game. Thus, teams with an extreme positive net non-offensive touchdown margin (return touchdowns scored minus return touchdowns allowed) will tend to decline the following season. Similarly, teams with an extreme negative net non-offensive touchdown margin will tend to improve the following season. What is an ‘extreme’ net non-offensive touchdown margin? I decided to use + or – 4. This number is a bit arbitrary, but in the context of a conference season that lasts only seven, eight, or nine games, this seems a reasonable baseline for extreme. Well, was I right? The following table lists the results for teams with an extreme positive net non-offensive touchdown margin from 2005-2014. 75 teams met the standard of +4. On average, these teams with extreme positive margins declined by about a game in the conference standings the next season. Looking at the data another way, only about a quarter of the teams improved the next season while more than 60% declined. A little more than 13% finished with the same conference record the next season. With conference expansion, since teams occasionally play a different number of conference games from one year to the next (because of changes in their conference affiliation or changes in their current conference’s size), I considered any conference record within a half game to be ‘stayed same’. For example, Central Michigan went 7-1 in the MAC in 2006 with a margin of +5 so they are included as an extreme positive team. The next year they played just seven league games thanks to the addition of Temple to the conference. Though their record ‘declined’ to 6-1, it is within a half game and considered the same for bookkeeping purposes. What about teams with extreme negative net non-offensive touchdown margins? The following table summarizes the results for those teams from 2005-2014. 63 teams met the standard of -4. On average, these teams improved by about a game in the conference standings the next season (quite similar to the one game decline by the other group). About 57% of the teams improved the following season, a little more than one-fifth got worse, and 22% stayed the same. Once again, a difference of only a half game in either direction was considered ‘stayed same’. So yes, I was correct in my initial hypothesis. Teams with extreme positive net non-offensive touchdown margins tend to decline the following season and those with extreme negative margins tend to improve. However, while real, the impact should not be overstated. Nearly 40% of those teams with extreme positive margins either stayed the same or got better and more than 40% of those with extreme negative margins either stayed the same or got worse. So, which teams from 2015 met the standard of + or – 4? Glad you asked. Take a gander at this table. Of the six teams with extreme positive margins, four (Alabama, Arkansas State, Houston, and Michigan State) won their respective leagues. In fact, three of the teams played in the College Football Playoff or New Year’s Six bowls. Plus, Southern Cal also won their division and played for the Pac-12 title. Be wary when projecting these teams to repeat in 2015. Perhaps the most interesting team with an extreme positive margin is Washington. The Huskies are getting a lot of preseason love and have probably shed their status as Pac-12 sleeper heading into 2016. It’s interesting their extreme margin could not land them a winning conference record in 2015. On the other side of the same coin, only two of the six teams with extreme negative margins played in the postseason in 2015. Cincinnati finished with at least six losses for the first time since 2010 and the seat is probably getting a little warm for Tommy Tuberville. 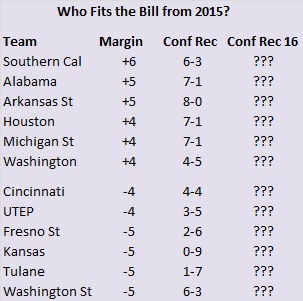 Don’t be surprised if the esteemed Tuberville has one of his patented ‘out of nowhere’ fantastic seasons in 2016. Washington State was the other school to qualify for the postseason despite an extreme negative margin. Somehow the Cougars finished with their best record in more than a decade. Looking at this list, perhaps the three other mid-major strugglers and the Big 12’s resident punching bag can show some signs of life in 2016.